More Details Moose Knuckles Men's Ballistic Bomber Jacket with Fur Trim Details Moose Knuckles ballistic bomber jacket. Removable hood with dyed fox fur (Finland) trim. Long sleeves; logo detail at left sleeve. Four front slip pockets. Full-zip front. Banded hem and cuffs. Cotton/nylon. Made in Canada. Moose Knuckles Men's Ballistic Bomber Jacket with Fur Trim Details Moose Knuckles ballistic bomber jacket. Removable hood with dyed fox fur (Finland) trim. Long sleeves; logo detail at left sleeve. Four front slip pockets. Full-zip front. Banded hem and cuffs. Cotton/nylon. Made in Canada. More Details Canada Goose Men's Chilliwack Down Bomber Jacket w/ Fur Hood - Fusion Fit Details Canada Goose "Chilliwack" bomber in Arctic Tech fabric for extreme conditions and climates. Fusion Fit, specially designed for smaller body frames. Drawcord hood; removable natural coyote (Canada or USA) fur trim. Long sleeves; zip pocket at left arm. Ribbed cuffs and hem with stretch. Hidden zip/button placket. Regular-fit silhouette. Single interior pocket. Welt pockets at sides. Front lower flap pockets. Hip-length hem. White duck down 625 power fill. Polyester/cotton shell. Nylon lining. Dry clean. Made in Canada. Canada Goose Men's Chilliwack Down Bomber Jacket w/ Fur Hood - Fusion Fit Details Canada Goose "Chilliwack" bomber in Arctic Tech fabric for extreme conditions and climates. Fusion Fit, specially designed for smaller body frames. Drawcord hood; removable natural coyote (Canada or USA) fur trim. Long sleeves; zip pocket at left arm. Ribbed cuffs and hem with stretch. Hidden zip/button placket. Regular-fit silhouette. Single interior pocket. Welt pockets at sides. Front lower flap pockets. Hip-length hem. White duck down 625 power fill. Polyester/cotton shell. Nylon lining. Dry clean. Made in Canada. More Details Canada Goose Men's Langford Arctic-Tech Parka Jacket with Fur Hood - Fusion Fit Details Canada Goose Langford parka with 625 fill power white duck down fill from the Arctic Program Collection. Fusion Fit, specially designed for smaller body frames. Fit: Slim. Approx. 36"L down center back. TEI score of 4; can endure daily temperatures from -15 to -25 degrees Celsius (5 to -13 degrees Fahrenheit). Removable natural coyote (Canada) fur lined protective hood. Insulated storm-flap underneath zip front provides warmth and protection from the cold. Mid-thigh length provides coverage and protection. Slim, insulated fit. Recessed heavy, ribbed knit cuffs keep out cold and snow. Zip pocket at chest; fleece-lined welt pockets for keeping hands warm. Polyester/cotton; nylon water-repellant lining. Made in Canada. 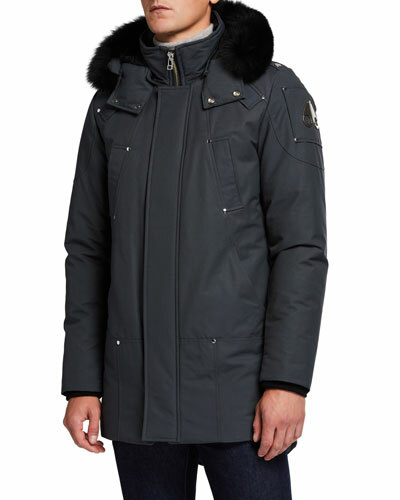 Canada Goose Men's Langford Arctic-Tech Parka Jacket with Fur Hood - Fusion Fit Details Canada Goose Langford parka with 625 fill power white duck down fill from the Arctic Program Collection. Fusion Fit, specially designed for smaller body frames. Fit: Slim. Approx. 36"L down center back. TEI score of 4; can endure daily temperatures from -15 to -25 degrees Celsius (5 to -13 degrees Fahrenheit). Removable natural coyote (Canada) fur lined protective hood. Insulated storm-flap underneath zip front provides warmth and protection from the cold. Mid-thigh length provides coverage and protection. Slim, insulated fit. Recessed heavy, ribbed knit cuffs keep out cold and snow. 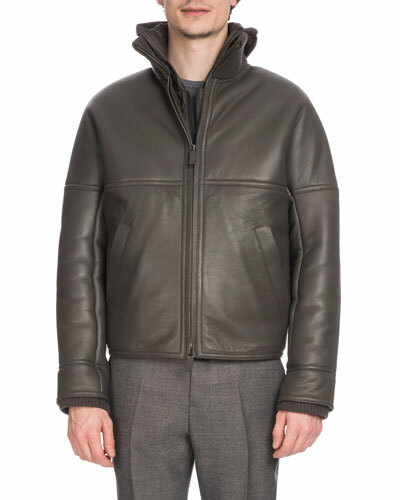 Zip pocket at chest; fleece-lined welt pockets for keeping hands warm. Polyester/cotton; nylon water-repellant lining. Made in Canada. 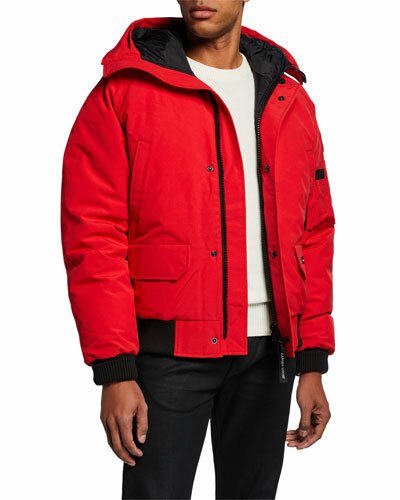 More Details Yves Salomon Men's Anorak Coat with Fur & Corduroy Trim Details Yves Salomon anorak jacket in nylon tech with corduroy detailing. Removable natural coyote fur (Canada) ruff. Natural rabbit fur (Spain) lining. Drawstring hood; hidden button/zip front. Adjustable drawstring at waist. Multiple pockets. Nylon/polyester/cotton/acrylic/spandex. Made in France. 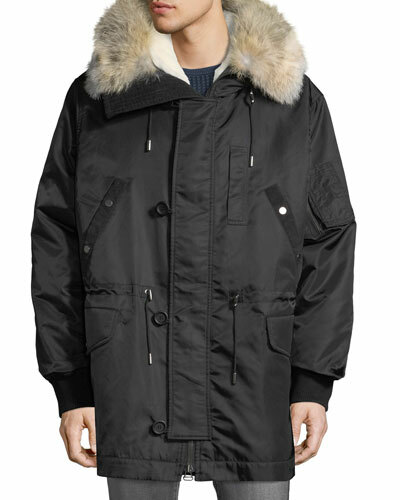 Yves Salomon Men's Anorak Coat with Fur & Corduroy Trim Details Yves Salomon anorak jacket in nylon tech with corduroy detailing. Removable natural coyote fur (Canada) ruff. Natural rabbit fur (Spain) lining. Drawstring hood; hidden button/zip front. Adjustable drawstring at waist. Multiple pockets. Nylon/polyester/cotton/acrylic/spandex. Made in France. 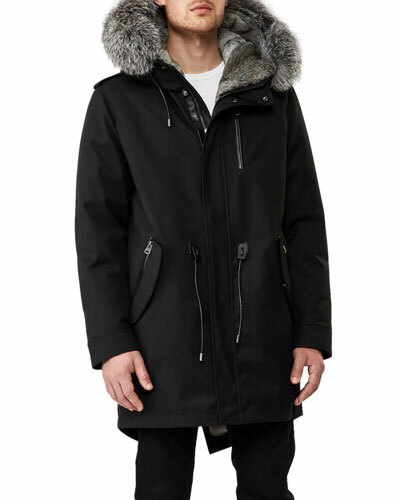 More Details Andrew Marc Men's Rockland Down Parka with Fur Trim Details Andrew Marc "Rockland" quilted parka. Removable hood with dyed fox fur (Finland) trim. 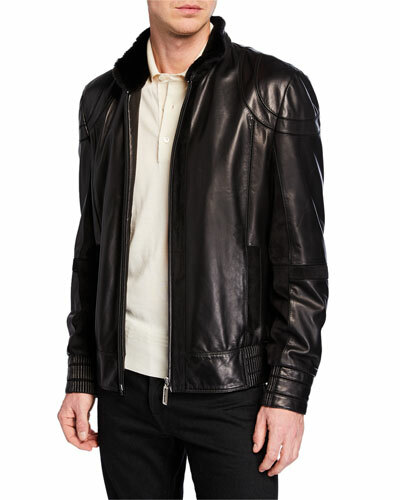 Stand collar; snap flap conceals two-way front zip. Long sleeves; inner elasticized cuffs. Snap flap pockets at waist and chest. Shell: cotton/polyester/nylon. Fill: down/waterfowl feathers. Knit trim: acrylic/polyester/spandex. Lining: polyester. Imported. 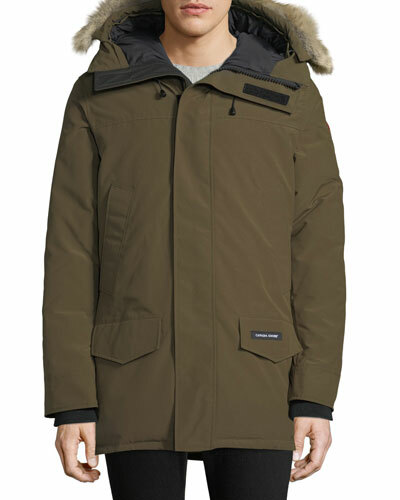 Andrew Marc Men's Rockland Down Parka with Fur Trim Details Andrew Marc "Rockland" quilted parka. Removable hood with dyed fox fur (Finland) trim. Stand collar; snap flap conceals two-way front zip. Long sleeves; inner elasticized cuffs. Snap flap pockets at waist and chest. Shell: cotton/polyester/nylon. Fill: down/waterfowl feathers. Knit trim: acrylic/polyester/spandex. Lining: polyester. Imported. 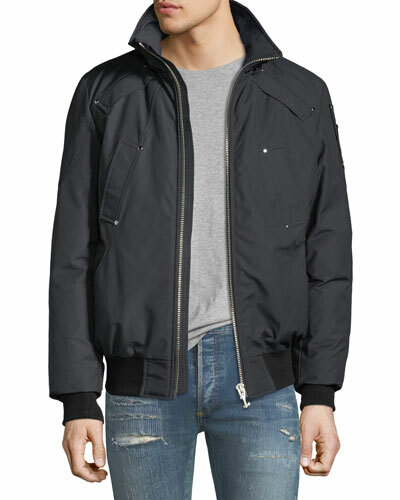 More Details Mackage Glen Leather Down Bomber Jacket with Fur Trim Details Mackage double-layer lamb leather bomber jacket with 90/10 down/feather fill. 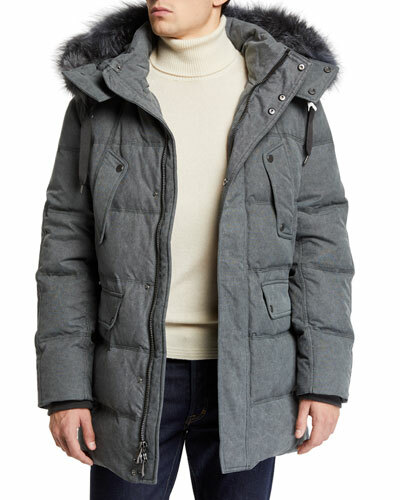 Hooded collar with natural rabbit (China) fur lining and natural coyote (Canada) fur trim. Concealed zip/snap front; zip front at bottom layer. Long sleeves; ribbed cuffs. Welt pocket at chest; zip pockets at sides. Ribbed hem. Lining, nylon. Imported. 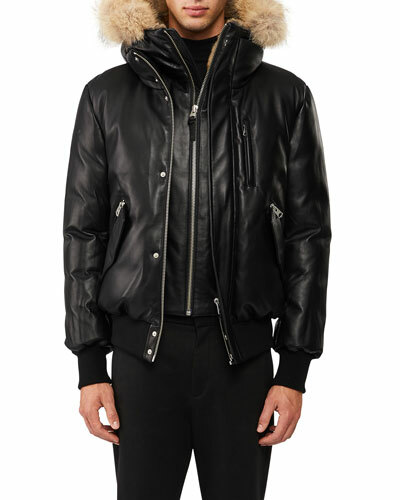 Mackage Glen Leather Down Bomber Jacket with Fur Trim Details Mackage double-layer lamb leather bomber jacket with 90/10 down/feather fill. Hooded collar with natural rabbit (China) fur lining and natural coyote (Canada) fur trim. Concealed zip/snap front; zip front at bottom layer. Long sleeves; ribbed cuffs. Welt pocket at chest; zip pockets at sides. Ribbed hem. Lining, nylon. Imported. 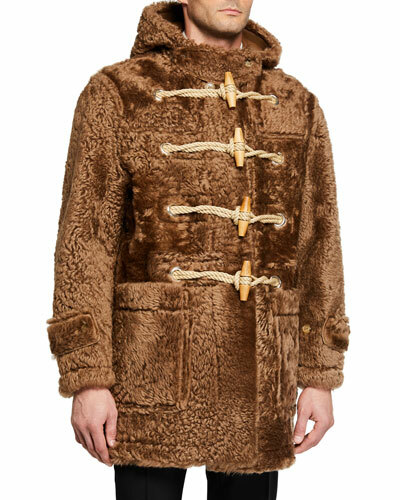 More Details Mandelli Men's Car Coat with Fur Collar Details Mandelli car coat with dyed nutria fur (Argentina) trim. 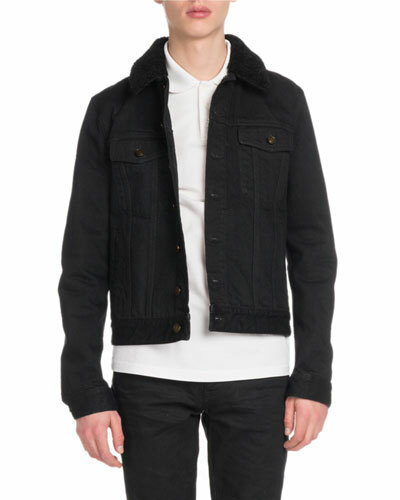 Spread collar; button-front placket hidden zip front. Side slip pockets. Straight hem. Wool/cashmere. Deer leather trim. Viscose lining. Made in Italy. 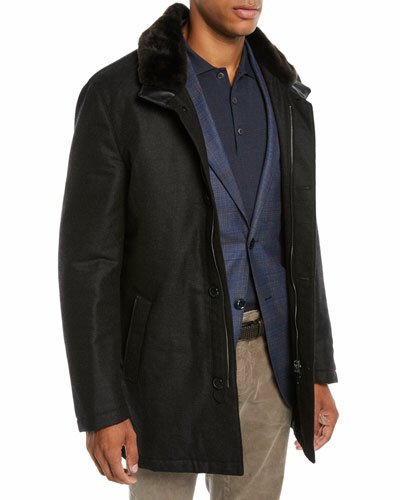 Mandelli Men's Car Coat with Fur Collar Details Mandelli car coat with dyed nutria fur (Argentina) trim. 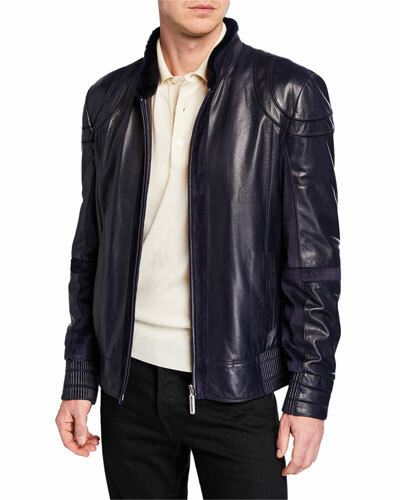 Spread collar; button-front placket hidden zip front. Side slip pockets. Straight hem. Wool/cashmere. Deer leather trim. 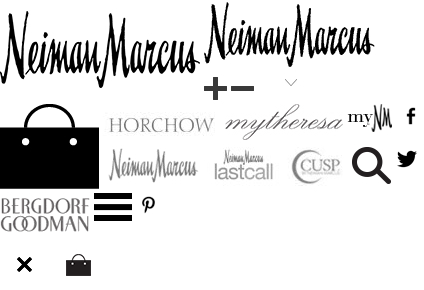 Viscose lining. Made in Italy.